Experience a unique night in a snow hut. 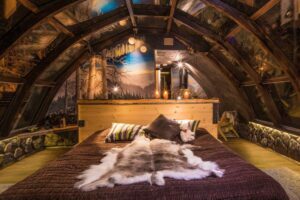 Experience a night in an atmospheric igloo. You’ll get to enjoy a peaceful night’s sleep and clean air in peace and quiet. The high-quality bedding will keep you warm throughout the night. With luck, you can see the display of the northern lights as the night sets. The arctic night will lead you to a relaxing night’s sleep. Featuring a sauna, log-wood furniture and stone fireplace, this cottage-meets-igloo is 2 km from Ranua Wildlife Park. WiFi and parking are free. Lapland Igloo provides a TV, tea/coffee facilities and a mosaic-tiled shower. Extras include a minibar, an iPod dock and a seating area. Thanks to the thick glass walls and roof, you can enjoy views of the lake and garden, or the Northern Lights if you’re lucky. An array of activities can be enjoyed on site or in the surroundings, including fishing, hiking and snowmobiling. Arctic Fox Igloos features igloo accommodation in Ranua, with impressive views of the Finnish Lapland sky and the neighbouring Lake Ranuanjärvi. Each igloo has a private sauna, kitchenette and bathroom. Sleep under the stars in the glass-walled bedroom, as well as have the privacy of a closed-in area where the sauna and bathroom can be found. Free WiFi is available in each igloo. There is an on-site restaurant with a bar, where a daily breakfast is served. There is also a garden with barbecue facilities. Arctic Fox Igloos staff can help arrange transfer services and safari activities. Guests can enjoy swimming, hiking and snowmobiling in the surroundings. 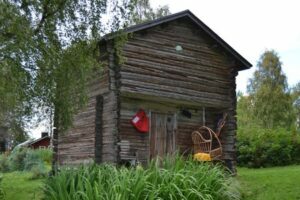 Traditional barn from early 1800s by the Lake Kuhajärvi has been renovated for accommodation while respecting the history of building. In this two-bed barn, it is possible to enjoy a good nights’ sleep without disturbances. Toilet and bathroom are in the main-building 15 meters away from the barn. There is a place for campfire and possibility to fish at Lake Kuhajärvi. Available on Summer season. Villa Wikkelä offers 3 separate bedrooms with high-standard beds for 6 persons and a bedroom upstairs for 4 children and adults. The living room has a real fireplace, spreading the coziness and warmness throughout the villa during the winter time. 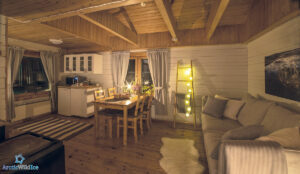 The kitchen is furnished with all the conveniences in a traditional Finnish house. The doors and windows in villa Wikkelä are made of glasses to amplify abundant natural light while never detracting from the main feature of the villa – the views of forest, river, and the northern lights. You can also find equipment for different kinds of activities from standup paddleboards, snowmobiles, bicycles, a boat, snowshoes, a quad bike, fatbikes etc in the Villa.